States are now rushing to push bills through allowing for gold and silver to be recognized as legal tender as politicians fear that the U.S. economy is going to collapse. 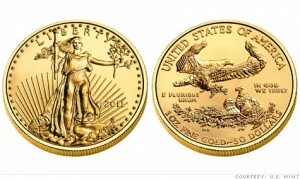 Gold An Silver May Become Legal Tender Again In Arizona Or Indiana!!! The Senate Finance Committee on Wednesday took the first steps to making such coins legal tender in Arizona. SB 1439 would give them the same legal status as the bills and coins authorized by Congress. Nothing in the proposal by Sen. Chester Crandell, R-Heber, would force anyone to actually accept these coins as payment for any debt. Their use would be voluntary. Utah took its first step Friday toward bringing back the gold standard when the state House passed a bill that would recognize gold and silver coins issued by the federal government as legal currency.